Looking at donors’ behavior through data is an important job, but it’s a complex one! Luckily, Langley Payton, an engineering student at Florida Polytechnic University, is up to the task of studying the giving trends and patterns that occur throughout the year. In this article, Payton breaks down how donors and registrants behave when they register for nonprofit fundraising events. If you’re planning a fundraiser, here’s what you can expect! Mark Twain once said, “Never put off till tomorrow what may be done day after tomorrow just as well.” We all procrastinate in one area or another, and our procrastination is not limited to scheduling that much-needed dental cleaning appointment or getting out of bed in the morning. In fact, it noticeably appears when we chose to donate money to our organization of choice. Why is procrastination such a problem in our everyday lives? To avoid the dreaded “you need to floss more” speech? Because you’ve convinced yourself that sixty more seconds under the covers will help you be more productive at work? What reason do we have for putting off supporting the charities we love? 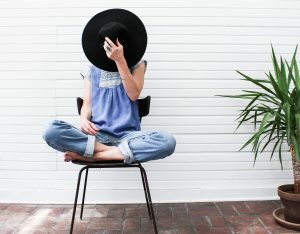 Perhaps the root of our procrastination lies in the fact that we’re reluctant to spend that money. Event registrations require deposits, and charity organizations and fundraisers require donations. Sure, there might be a deadline involved in turning in the money; there may be a timeline for ticket purchases or a set timeframe for a fundraiser. Why donate until it is absolutely necessary to click that “Submit Payment” button? It might be that we just like knowing that we have that money in our pocket and are reluctant to spend it. So, when you’re hosting your next event, remember that these same people who put off waking up or going to the dentist, the masters of procrastination, are the people who support you. Then, plan accordingly. But don’t forget! Donors aren’t the only ones who procrastinate when it comes to fundraising. Don’t underestimate the amount of time it will take to plan your fundraising event. Give yourself at least a few months for a simple event and even longer for a more complex or involved one. Say you’re hosting a production at your local theatre. All attendees are required to register and pay for a reservation. When should you expect to collect most of your registrations? Since we’ve established that most people you are inviting will procrastinate, you can expect that registrations will peak at the last possible moment. To get an idea of what this looks like in real life, I collected some data. In fact, I collected a lot of data. I took a snapshot of every event that took place through the Qgiv platform over a one and a half year period. I looked at how many transactions were processed on a day-by-day basis until the end date for each event. I also looked at daily transaction totals from fifteen days before the event to five days after the end date. After some Excel magic, I could visualize the trend of the number of transactions being made over this twenty day period. I knew that the number of transactions and when they occurred would tell me how proactive people are about registering for an event. If significantly more transactions occurred on one day compared to another, we could say the first day was a more common day for people to donate. I wasn’t aiming to pin down a day of the year or day of the week that people tended to give; instead, I was trying to pin down which time period during the build-up to an event was most popular among donors and registrants. I wanted to see if there was a general pattern surrounding donations and registrations. 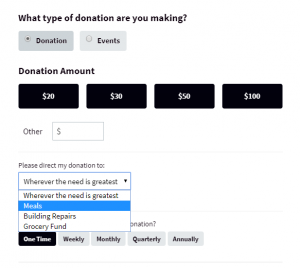 Do donations increase overall until the day of the event, or do they decrease? Are people more likely to spend their money to register earlier or later? My starting point was set fifteen days prior to an event, which established a sort of baseline for the number of transactions being made. I found that, thirteen days prior to the start of the event, the number of donations dropped. Donations then pick back up and steadily increase until about six or seven days prior to the event before another distinct dip occurs. Though that second drop is distinct, the number of transactions does not get as low as it was thirteen days prior to the event. After that second dip in transactions, though, donations start coming in quickly. Between six days and one day before the event, the number of registration transactions increase rapidly. The number of transactions peak one day before the event, but donations take a nosedive afterward. The smallest percentage of transactions were made either twelve or thirteen days before the event. So does this same trend occur for different types of events? After all, a small church barbeque fundraiser may not run the same as a university’s alumni booster club fundraiser. To adjust for some those differences, I grouped events by the total transactions into different categories. Some of the categories I looked at included events with less than 100 transactions, 176 to 281 transactions, and more than 5,000. Generally speaking, all groups follow the same pattern. 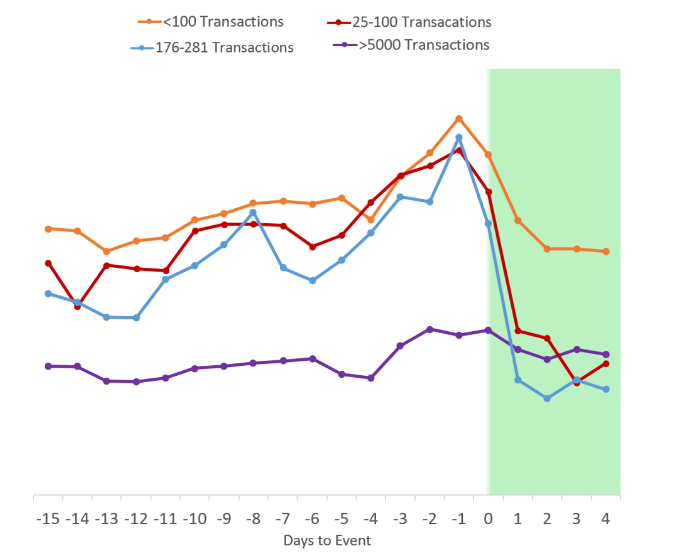 Although different events had varying levels of total transactions, their graphs are roughly identical. However, this trend appears just slightly different for those events bringing in more than 5,000 total transactions. For this group of high-volume events, the trend is not quite as defined. In fact, the percentage differences are not as drastic. The trend line is a little flatter. Despite this slight difference, though, we come to the same conclusion; donors wait to register for events, then they pour in during the last few days. This trend can be exasperating for fundraisers and event planners, especially when you’ve put lots of planning and effort into your event. But it can also be a relief! 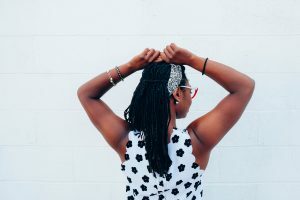 Knowing that, statistically, donors will wait until the last days before an event cutoff to register can be reassuring when your event is looming and your registration numbers are low. The next time you plan an event, market it on your website and social channels, and don’t see an immediate influx of registrants or event donors — don’t panic. You’ll see a dip in event registrations and donations about two weeks before the event, and another dip a little less than a week before the cutoff date. But your donors are there, and they’ll register for your event a day or two before the cutoff; they’re just putting it off until tomorrow, and maybe the day after that. Langley Payton is a student at Florida Polytechnic University pursuing a Master’s in Engineering. She is from Tallahassee, FL where she received her undergraduate degree in Mathematics at FSU. Besides her love of all things numbers, Langley relishes any opportunity to water ski, rock climb or eat dark chocolate.